Working with a lighted torch and molten solder can make anyone a bit nervous, and it should. 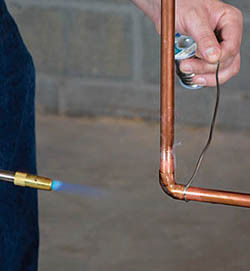 The consequences of a soldering mistake can range from a leaky pipe to a house fire. As with most craft skills, however, the keys to success are practice and planning. 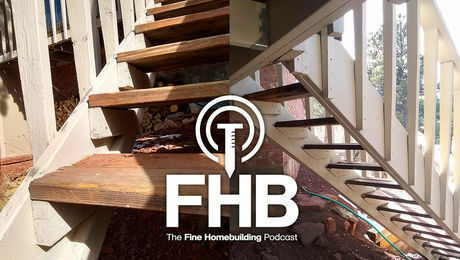 Even for small projects, draw up a plan that minimizes the number of fittings; don’t just stick pipes together willynilly. Preassemble and solder as many sections as possible on a workbench. And make sure that every fitting that has to be soldered in place will be easily accessible. To prevent burns, always wear safety glasses, and never solder directly overhead. 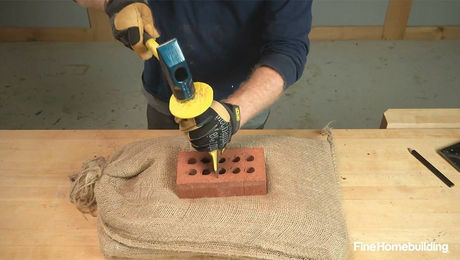 To prevent fires, use a proper heat shield (not just a scrap of sheet metal) whenever you have to solder close to combustibles, and always keep a working fire extinguisher close by. • Tubing cutter with attached pipe reamer. • Wire-bristle fitting brush (sized for 1/2-in. or 3/4-in. fittings). • Small can of flux and a disposable acid brush. 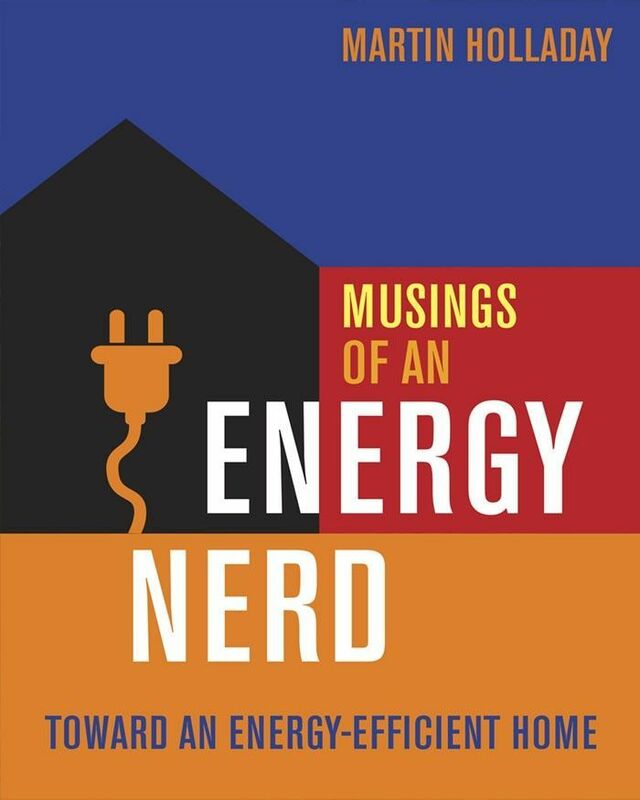 • Torch (sidebar p. 126). • Roll of lead-free solder. 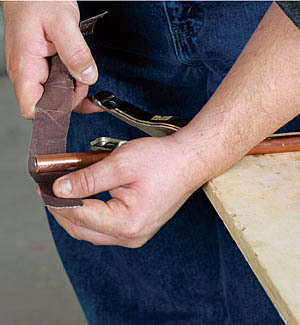 Step 1: To fashion the strongest bond, size the pipe to extend all the way to the back (the shoulder) of the fitting. Step 2: Cut it tight and square. 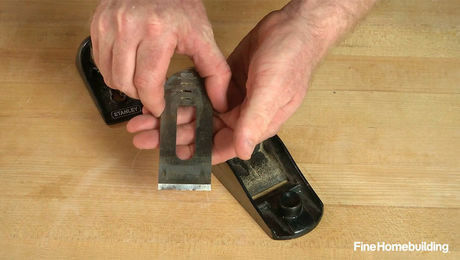 Use a tubing cutter, rather than a hacksaw, to make a perfectly square cut. Step 3: Ream the end of the pipe to remove the burr left by the pipe cutter. Step 4: Scour the pipe and the fitting. 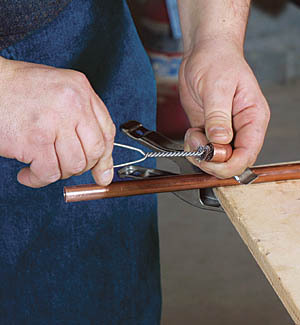 To remove oxidation (tarnish) that would impede the bond between solder and copper, polish the outside of the pipe with a length of emery screen (photo left), and scrub the inside of the fitting with the brush (photo right). Clean both surfaces until they shine like a brand-new penny. Step 5: Apply flux to deep-clean the metal. Brush a liberal coating of flux onto both surfaces (the flux removes minute traces of tarnish and etches the copper to promote adhesion with solder). 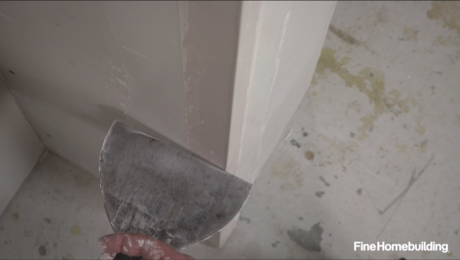 To prevent contaminating the flux, close the cover tightly when not in use, and store the brush in a plastic bag. 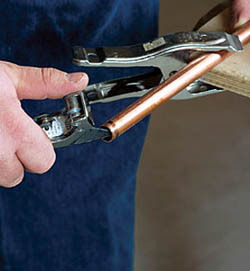 Today’s lead-free solder requires a higher temperature than a propanefueled torch can deliver. Professional plumbers rely on powerful acetylene rigs that cost hundreds of dollars and are highly explosive. 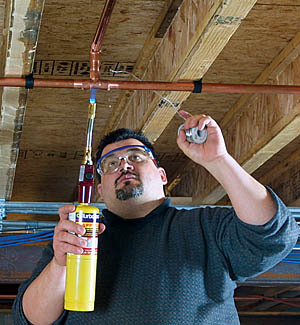 For occasional users, the best alternative is MAPP gas. 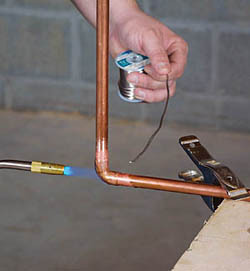 MAPP (a combination of acetylene and propane) burns hot enough to solder 3/4-in. pipes, and it’s widely available in disposable cylinders like those used for propane. 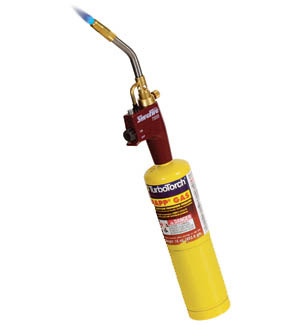 For safety and convenience, attach the MAPP cylinder to a high-quality, self-igniting torch such as this SureFire T655 (www.bernzomatic.com). A push of a button lights the flame, and it extinguishes just as easily. 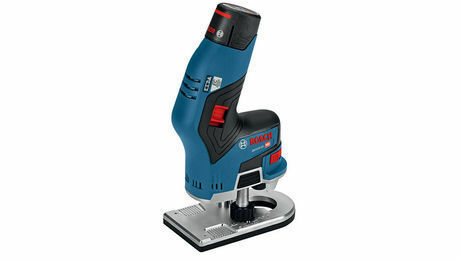 With no need to switch hands to reach for a spark igniter or fiddle with the gas, you can work faster and, most important, safer. The entire setup costs less than $70. Step 6: Blue flame to the fitting. Direct the flame to the middle of the fitting (the solder is drawn to the heat). 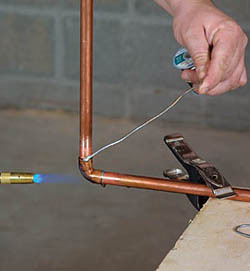 To promote uniform heating, keep the flame moving, in a slight arc, around the fitting. The hottest part of the flame (the inner blue cone) should always touch the copper. Step 7: Color and flux tell you it’s time. Continue to apply heat until the flux begins to melt and the copper takes on a shiny, iridescent appearance. Then touch the tip of the solder to the joint; if it’s hot enough, the solder will pour in and encircle the fitting before it begins to overflow. When working with 3/4-in. 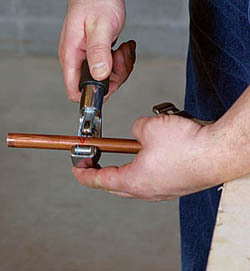 or smaller pipes, there’s no need to drag the solder all the way around the joint to fill it adequately. Step 8: Work from lowest to highest. Solder the low end of a fitting first because the high side will stay hotter longer. Be sure to reel off enough solder ahead of time so that you can move effortlessly from one joint to the next. 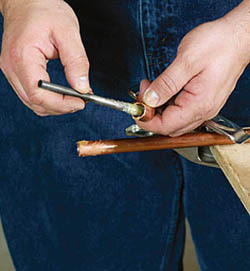 If the fitting does cool off, fan the tip of the flame over the copper to raise the temperature without overheating. 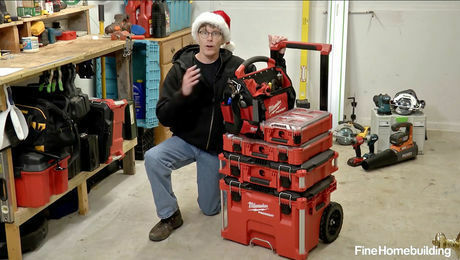 Step 9: Not just for show. 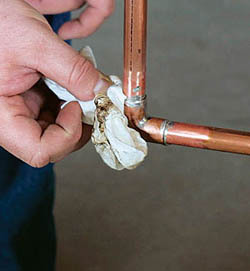 Even if the pipe is to be buried beneath drywall, always wipe the solder with a rag before it has had time to cool. 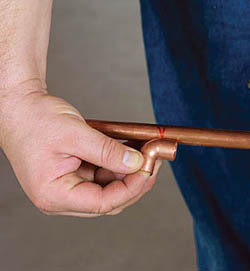 A bright, uniform solder joint between the fitting and the pipe is proof of a job well done.